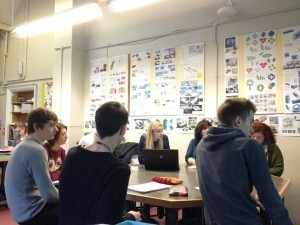 Just before Christmas we met again with this year’s Designing for the Future’s A level students at Collyer’s Sixth Form College to review their product ideas. It was really good to see these students focussing on the needs of older people and considering the aesthetics as well as the functionality of their designs. The next stage will be the judging in April when we will be joined by the winners from our University of Brighton competition and also Marie Harris, managing director of social enterprise Beta Futures with whom we are hoping to partner in the future.